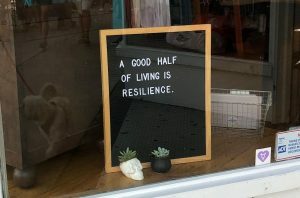 “A good half of living is resilience.” I was wandering down the street glancing into shops when this quote, pictured above, in a shop window stopped me in my tracks. As a therapist, I know the importance of resilience when recovering from traumatic experiences. It is vital to have things like coping strategies to use in order to move on. What if we broadened the idea of “resilient living” into everyday life though, not just when focusing on trauma recovery? For many years, I specifically did domestic violence and sexual assault counseling. Every client I worked with was either currently being abused or had previously been abused in some way. The bulk of our sessions together would focus on rebuilding a sense of self-worth, understanding how to manage triggers, learning to trust others again, etc. All of these tasks centered around resiliency with an outlook towards the future. Make a list of at least 5 things that you know comfort you and lift your spirits. Many times, when life goes wrong, we easily forget simple things we can do that fill us up, bring joy, and keep us going. Write these ideas down and post them somewhere like your bathroom mirror or refrigerator so they are easily accessible when needed. Also, if possible, practice these things on a regular basis so they become self-care habits. Remember times when you were resilient in the past. You didn’t get into the college you really wanted but you survived! Your first romantic relationship ended and it felt like life was over but you survived! Your boss gave you really difficult feedback at work and although it stung, you survived! There are countless examples of resilience to be found in your life and every single time you made it through and came out the other end (probably stronger!). Also, think back on what worked then to get you through and remember that just how things got bad, they also got good again. Address issues such as anxiety and depression before they become compounded by other life circumstances and struggles. Most people who start therapy do so when they are in some sort of crisis instead of as a preventative measure. If you feel stable right now, it will feel easier to handle other challenges that come your way. Even if therapy doesn’t feel right for you, addressing mental health struggles by finding support in online groups, self-help books, listening to podcasts, etc is extremely valuable. Give resiliency some of your attention and be intentional about building it into your life… You will appreciate having the reserve ready for when you need it!